"Appreciate the Awesomeness of the Universe..." This was the theme 8th-grade science teacher, Aaron Daniels, from the Plymouth Community Intermediate School, implemented when he brought two of his science classes into the Blake Planetarium (located inside the school in Plymouth, MA) to image and learn about galaxies, nebulae, and star clusters. On May 17, 2018, Mr. Daniels brought the first two of his classes into the planetarium where Planetarium Director, Steven Davies presented a lesson he produced demonstrating the distances of deep-sky objects along with explaining what equipment was needed to get a better look at these objects. The equipment was to be Insight Observatory's Astronomical Telescope for Educational Outreach (ATEO). 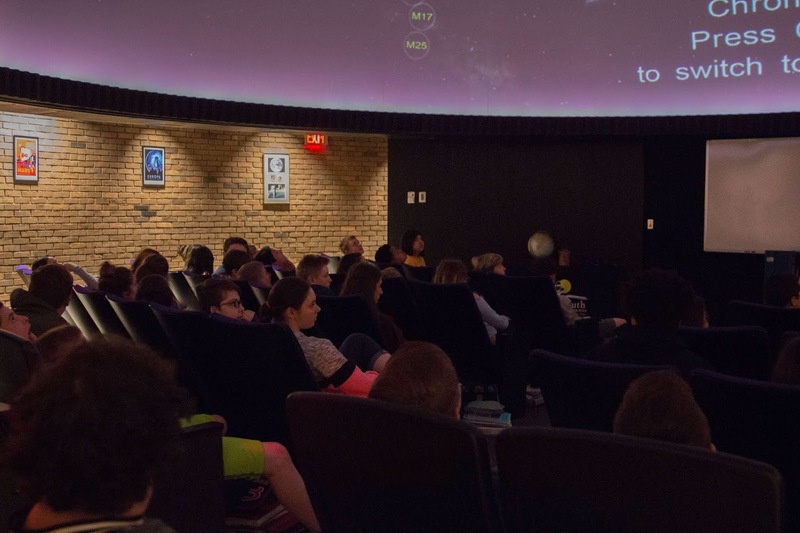 Mr. Daniels 8th-grade classes engaged in Mr. Davies lesson in the Blake Planetarium covering the distances of galaxies, nebulae and star clusters and how we get a better look at them. Photo by Emily Goonan. When I asked Mr. Daniels what his objectives were for using the ATEO with his classes he stated "Awe is felt when our mind begins to comprehend something that we did not comprehend before. This can be as simple as noticing the beauty in the intricacy of a flower or in marveling at the immense expanse of space. Our goal was to point the telescope towards 24 small patches of sky to capture galaxies, nebulae, and star clusters. I hope that these images our students collect stay with them and bring a feeling of greatness whenever they need inspiration. In addition to the deep space photograph that the students used the ATEO from Insight Observatory to take, they will be required to create a caption. Their caption can be artistically applied to their photograph in any way they would like." Once the list of deep-sky objects was submitted for imaging, they were immediately acquired that night as the weather was very cooperative the whole time I had my visit to the observatory. As John Evelan, Managing Partner of SkyPi Remote Observatory, and I were visually observing galaxy clusters with his 18" Dobsonian reflector telescope, we could hear the ATEO slewing all night long hitting the targets on the student's list. Once the images were processed by the staff at Insight Observatory they were uploaded to Astrobin.com, a website that hosts Insight Observatory's Image Gallery. Individual collections were created for each class where Mr. Daniels and his students may access the data they retrieved with the ATEO. demonstrating how the ATEO acquires images of galaxies, nebulae and star clusters. Photo by Emily Goonan. Coincidently, I had just arrived on my annual trek to Pie Town, New Mexico to make some enhancements on our Astronomical Telescope for Educational Outreach (ATEO) and thought it would be a bonus for the students if I broadcasted live from the observatory and explain how the remote telescope imaging system worked. After my brief live presentation, Steve presented his lesson followed by the students teaming up to request their deep-sky image using Insight Observatory's Educational Image Request Form (EIR). Each group was assigned an object they then would enter into the form along with their desired exposure time. We repeated the same format for the third class the next day. Imaged by 8th-grade students in Mr. Daniel's science class from PCIS, Plymouth, MA. 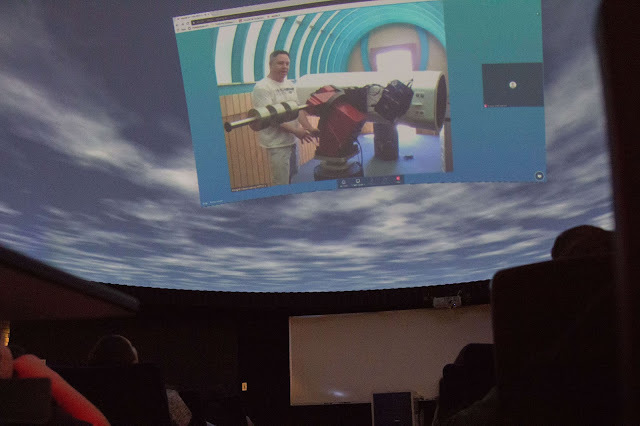 Upon completion of the student's assignment, they returned to the planetarium to present their images taken with the ATEO and what they have learned from this experience. I would like to thank Mr. Daniels and Mr. Davies for allowing Insight Observatory to collaborate with their classes and the opportunity to bring the universe to their classroom.